It’s been years since I read and cried over Jane Eyre so, when I signed up for The Classics Club, I knew that I wanted to tuck some more Charlotte Bronte under my belt. The choice of Villette was more or less random but it’s one that I’m abundantly pleased about. Villette and I had a rocky start and it wasn’t all plain sailing but I really enjoyed it over all. Would I say that I preferred it to Jane Eyre and that it was now my favourite of the Bronte works that I’ve read so far? Not exactly but it is a truly great book. 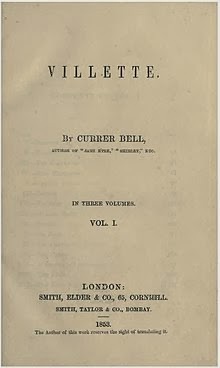 Villette was Charlotte Bronte’s last book, written after the death of her brother Branwell and both Anne and Emily. It’s impossible not to notice that this later work has a thread of sadness running through it. The story itself isn’t full of trauma or excessively bleak but there is something about Lucy Snowe’s tone as narrator that is almost bitter and hints at something darker. Something behind the writing that permeates the story and suffuses everything Lucy goes through with an edge. I’m not always sure that I’ve ever really read anything and felt as though I could “see” as much of the author through the pages and it made Villette into something quite special. The mastery of it is really in the narration. Lucy Snowe is a young woman that has suffered a great, undisclosed tragedy and is making her way through life in the mid-1800s as a single, not particularly wealthy woman. She is determined and independent and committed and all of the things that you might have come to expect from a Charlotte Bronte heroine but she’s also jaded, slow to trust anybody (readers included) and struggling with mental illness. What’s remarkable is how everything that Lucy is is reflected perfectly in her narration. Readers only know as much as Lucy feels able to disclose at any one time and everything that she is trying to suppress in her personality (her passion and her need to belong) are suppressed as she narrates, showing through only when her trials in the novel push her almost to breaking. The plot is a relatively simple one – Lucy Snowe grows up among friends but without family, moves to the small French town of Villette, unable to speak French and without any connections, and strives to establish her independence, dreaming not of being swept off her feet by a local nobleman but of economic security and stability. That doesn’t read as particularly ambitious now, obviously, but I can imagine how almost revolutionary it must have seemed to mid-nineteenth century readers. It’s a quiet story in many ways but the telling of it is where the magic happens. The other characters are hard to get to know because they’re masked by Lucy’s refusal to ever really open up to her readers. Her temperament and perceptions shift and with them, the way that characters are portrayed. She’s the ultimate unreliable narrator and, rather than finding it frustrating, I loved it. Not only do you get to know Lucy through the decisions that she makes and the way she chooses to live her life but you get a sense that she’s a real person; she talks to readers sometimes, which in many books I hate but here was used well enough that it didn’t feel awkward, just perfectly in keeping with the character that you feel as though you know. There are twists where Lucy reveals that she hasn’t been entirely honest with readers and moments where something just seems…off about the tale and it lends intrigue where otherwise there wouldn’t be much. I liked the other residents of Villette and their relationships with each other (particularly Dr Bretton and his mother who lend some often welcome light relief) and with Lucy are interesting enough but there were times when the story felt slow to me and that stopped it being a sweeping glorious success. Not to mention how annoying Lucy’s friend the vapid Ginevra Fanshawe can be…I do understand that she is meant to be frustrating but still. So it’s all impressively clever and the writing is outstanding. And yet I’m not falling over myself to get you all to go out and buy a copy as fast as your feet can carry you. Mainly because, even though I fully appreciated Villette‘s brilliance as a work of literature and one that I would definitely recommend, Lucy Snowe’s story just didn’t move me as much as good old Jane Eyre’s. I did close the book feeling pensive and the ending is…disorientating but I didn’t close it feeling as much as I did with Bronte’s earlier work. I know that comparison isn’t really necessary and compared to other books, both are far better than average so it’s a hollow comparison in many ways but one that I’m ending on nonetheless! Overall time: Villette is sheer manipulative literary brilliance. It’s not flashy and it isn’t a breath-taking tale of adventure but it is a heartfelt story on one woman’s struggles, the people she meets and her hopes for a better future. It’s a favourite for a lot of people and a book that I imagine would stand up to re-reading better than most. It didn’t break my heart or rip my world asunder but I’m definitely glad I read it. A word about editions: I read the free Kindle version and it didn’t include French narration. My French was enough that I usually got the gist of what was happening but quite a lot of the dialogue hops between French and English so you might want to make sure that you have an edition with translation if you want to understand every word and aren’t a fluent French speaker. February 2014, Where Did You Go? !